Is it all aboard or abandon ship at this family-friendly Friday feast? The QE2 was known it is sailing heyday for lavish spreads and luxe dinner parties, but now it’s anchored in Dubai, how does its Friday brunch measure up to its high reputation? The three-and-a-half hour package runs from 12.30pm until 4pm, taking place at the floating hotel’s all-day dining restaurant, Lido. The space itself is pretty simple, with accents of light green furnishings brightening an otherwise pretty plain restaurant space. It’s already almost full when we arrive, with long tables filled with families already piling there plates. 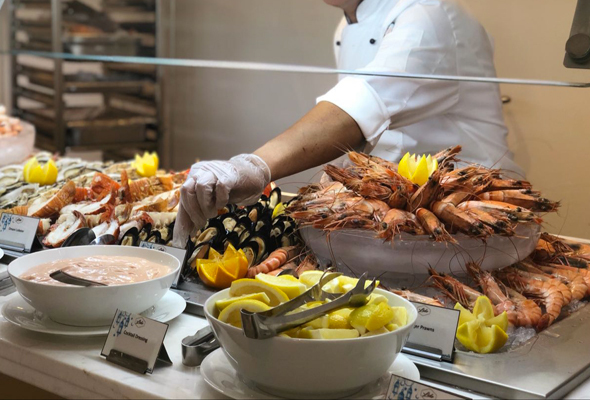 The buffet selection is brilliant, with everything from seafood and salads to made to order pasta, Asian dishes and a live carving station. The dishes are constantly being stocked up by dozens of chefs, and the layout is clear enough that you can move around everything with ease. The seafood is fresh, salads are varied, and we have to go back for seconds of the traditional roast dinner, with a choice of chicken or beef and fluffy Yorkshire puddings the star of the show. Service is faultless – staff are friendly and a team of waiters and waitresses are always on hand to clear away plates and top up glasses. The live entertainment is a bit hit and miss, with one singer stronger than the second. But, song choices are popular with brunch goers and many are dancing along with little ones by the time the third set kicks in. It’s a brilliant option for families, with a huge play area adjacent to the restaurant housing all the toys and playhouses little ones could need for a fun-filled afternoon. While it’s an indoor-only restaurant, as brunch progresses, guests drift outside towards the downstairs deck, and we only wish we were able to enjoy the alfresco setting more. We’ve since been advised that this will soon open up for the Friday brunch seating, which would definitely bring us back.